This deck is a work perpetually in progress, and will probably remain so until after Episode III comes out. I'm creating it strictly for my own enjoyment and not for profit; but if you use any of these images on your site, I would appreciate a credit and courtesy link. Though friendly and cheerful, Jar Jar Binks often finds himself in others' bad graces due to his tendency to act without thinking. Even Qui-Gon Jinn loses patience with this walking embodiment of his own admonition to "use your instincts". 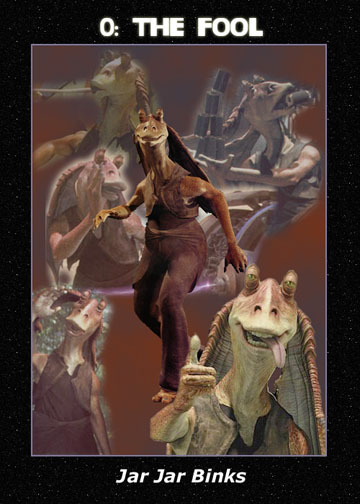 Hopelessly accident-prone, Jar Jar nonetheless seems to lead a charmed life, avoiding serious injury and sometimes even helping himself and others by sheer chance--or perhaps the workings of the Force. He has a childlike view of the universe and of how people should treat one another, and is frequently bewildered by the aggressive behavior and intrigues of those around him. Reverse Meanings: Bad decision. Apathy. Hesitation. Negligence. No one is more intimately acquainted with sacrifice and waiting than Obi-Wan Kenobi, and no one has a deeper understanding of why these things are necessary. 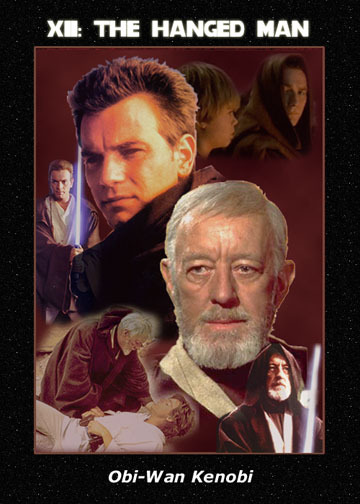 We see him as a young man, when the death of his Master Qui-Gon Jinn marks his transition from learner to teacher as he takes up responsibility for young Anakin Skywalker, whom he will later lose to the Dark Side. He is also pictured at the end of his life, emerging from decades of self-imposed exile as Luke Skywalker comes of age. The sacrifice of his own life completes the circle, and marks another transition as he becomes one with the Force and continues to guide Luke with a new level of insight. Meanings: Life in suspension. Transition. Abandonment. Renunciation. Reversal of the mind and one's way of life. The changing of life's forces. The period of respite between significant events. Sacrifice. Repentance. Readjustment. Regeneration. The approach of new life forces. Reverse Meanings: Lack of sacrifice. Unwillingness to make the necessary effort. Failure to give of oneself. Preoccupation with the ego. False prophecy. Useless sacrifice. A young woman of strong intellect and intuition, Amidala augments her power and security through her ever-changing appearance. 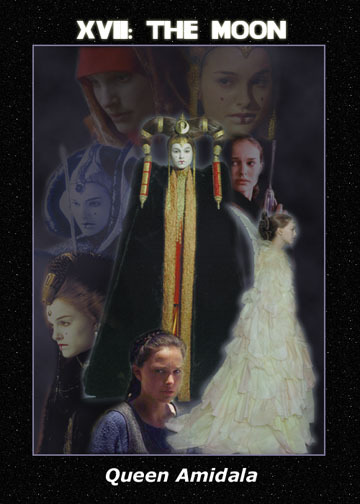 Elaborate clothing and makeup obscure her youth and unimposing size--the same traits that allow her go mostly unnoticed in her guise as the handmaiden Padmé. She is herself deceived in Senator Palpatine, her people's representative to the Republic, who seeks to use her to further his own political interests. She forms an instant bond of friendship with young Anakin Skywalker, unaware that he will grow up to love and later betray her. Reverse Meanings: A minor deception recognized before damage is done. Trifling mistakes. Overcoming bad temptation. Disclaimer: This web site, its operators and any content on this site relating to "Star Wars" are not authorized by Lucasfilm.